James J. Tissot, "Pardoning of the Good Thief" (1886-1894), opaque watercolor, Brooklyn Museum. Larger image. It was a terrible thing to be unjustly condemned to be crucified. It added insult to injury to be crucified between two obvious criminals. But there's a story here and a lesson. This brief passage relates one of the most amazing prayers and promises in the entire Bible. Though they could have been common thieves, they also might be the kind of highwaymen that swoop down on lonely groups of travelers from Jerusalem to Jericho, strip them of their possessions, and leave them for dead, as in the case of the victim in the Good Samaritan (Luke 10:25-37). The same Greek word is used to describe them. Bandits like these two are the terror of travelers. One of these highwaymen, dying on a cross beside Jesus, now takes up the cat-calling begun by the soldiers, "You are the Christ, aren't you? Then save yourself and us!" It was probably much like the cruel teasing of inmates that goes on in prisons today. It is a jab at authority of any kind, a pulling of everyone down to your own level. The thief is making fun of Jesus' inability to do anything despite the exalted title of "Messiah." Where is this talk of "Messiah" now? he sneers. You're dying just like us. Death is the great equalizer. 'He trusts in the LORD; let the LORD rescue him. Just below Jesus' feet the soldiers are casting lots to see who gets his clothing.8 His last effects aren't given to his family. They go to the soldiers as the "spoils" -- also in fulfillment of Scripture (Psalm 22:18). It is the final insult. These taunts are making the other condemned brigand very uncomfortable. The word blasphēmeō can refer to reviling humans, but also to "speak irreverently, impiously, disrespectfully of or about ... God. "10 The second bandit may be condemned to death, but he has not lost his faith, for he asks, "Don't you fear God?" To stand by and participate in such an unrighteous act as to execute an innocent man is an impious, sinful act. The second brigand refuses to desert his sense of right and wrong. By any measure, this statement is astounding! Jesus' disciples have fled or linger disillusioned that dark Friday at the margins of the crowd. Their hopelessness is echoed by the men on the road to Emmaus, "... They crucified him; but we had hoped that he was the one who was going to redeem Israel" (Luke 24:20-21). But here on the cross, a fellow condemned man, life ebbing out of him, looks to the center cross and sees not another dying man, but the Messiah himself. Somehow, he understands that Jesus is not an impostor and that he will still receive the Kingdom that belongs to the Messiah. How can this quality of faith exist at such a dark time? Already the darkness is falling over the whole land, and yet a dying thief believes. Did he confess his sins? Yes. "We are punished justly, for we are getting what our deeds deserve" (Luke 23:41). Does he repent? Not verbally, but yes, I think he did. His repentance and hope prompt his plea for mercy, "Remember me...."
But was he saved? Jesus commanded baptism. In the longer ending of Mark's Gospel, Jesus says: "Whoever believes and is baptized will be saved, but whoever does not believe will be condemned" (Mark 16:16).11 But things don't always follow the prescribed order. At the house of Cornelius, for example, the Holy Spirit falls upon Gentiles who believe the words Peter is saying to them. So Peter baptizes them after the Holy Spirit comes upon them (Acts 10:44-48). The key here is faith. The thief on the cross believes; his prayer to Jesus is bursting with faith. He has more faith that day than any other human observing this gruesome scene. We could multiply references to the primacy of faith, such as, "whosoever believes in him... (John 3:16, 36; 6:40), "your faith has saved you" (Luke 7:50), and many others. The thief on the cross gives us an illustration of saving faith that is instructive to us as we seek to understand this mystery of our salvation. The example of the thief on the cross is often cited as the precedent for deathbed conversions. And so it is. I don't doubt that the thief had attended one of Jesus' outdoor teachings and come to "some sort of faith" there. And so have many who repent and confess Christ on their deathbeds. The difference between "some sort of faith" and "saving faith" is true repentance and the commitment to Christ that repentance implies. It is possible, I believe, to be saved at one's deathbed. But I've seen too many people who say, "I'll follow Christ later. For now I want to have some fun." Some of them don't get a chance to repent on their deathbeds. They die in accidents or from heart attacks, never having a chance to repent at the end of their days. Yes, deathbed salvation is possible -- the thief on the cross indicates this -- and it may even be real (God only knows the heart), but it must not be relied upon. 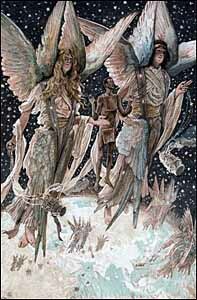 James J. Tissot, "The Soul of the Penitent Thief" (1886-1894), opaque watercolor, Brooklyn Museum. Larger image. In 2 Corinthians 12:3-4, Paul seems to equate the "third heaven" with paradise. I think we can identify paradise with heaven and be pretty safe. Jesus is promising the believing thief that he will be with Jesus in heaven "today." We know what an encouragement the account of the Thief on the Cross has been to Christians down through the ages. But how about Jesus, dying alone on the cross? What did it mean to him? I believe the Father blessed his Son with this strange companion during his last hours -- a believer, and a very strong believer at that. Jesus had often chaffed at the unbelief he saw around him. His disciples themselves often exhibited "little faith. "15 But occasionally, Jesus encounters someone with great faith. A Roman centurion tells him that he doesn't need to physically come to heal his servant; all he had to do was speak the word and he has authority to have it accomplished (Luke 7:2-10). Jesus is amazed at the man: "I tell you, I have not found such great faith even in Israel" (Luke 7:9). If you've ever taught, you know how encouraging it is to have a student who grasps what you are trying to communicate. Even if most students fail to understand, at least your prize pupil does, and that brings great satisfaction. The centurion is one of those prize pupils; the thief on the cross is another. Neither is acceptable to religion -- one a Gentile, the other a criminal. But each has great faith, and each, I am sure, brings joy to Jesus' heart. As Jesus dies for our sins, he does not die completely alone. The Father gives him a companion, a believer with mighty faith, a believer who can look past the raw wood and nails and blood to the heavenly kingdom that Jesus will inherit. He is a believer who wants "in." Jesus answers him as life on earth wanes, "Yes, you'll be with me there -- today in paradise. We'll go together, you and I." Father, you never leave yourself without a witness. Even Jesus' close disciples faltered in their faith. But then you raised up a thief who had great faith and received a great promise. Please strengthen my faith. I am often so upset and confused by the buffeting winds of my life. Let me see beyond them to Jesus. By your grace, may my faith bring some joy into your breaking heart as did the thief's faith in Jesus. In Jesus' holy and precious name, I pray. Amen. Q2. (Luke 23:39-43) Why is the thief's faith so astounding in this situation? What did the thief receive that day? What do you think this meant to Jesus? What did the thief have to believe about Jesus to cause him to ask him, "Jesus, remember me when you come into your kingdom" (Luke 23:42). What are the elements of his faith? Did the thief confess his sins? Was he repentant? How do you think the thief's request make Jesus feel? What are the elements of Jesus' promise to the thief in Luke 23:43? What are we disciples supposed to learn from this strange exchange on the crosses above our heads? What does Jesus intend us to get out of this? 5. Lestes, BDAG 594, 1. 6. The word is also used to describe a "revolutionary, insurrectionist, guerrilla" (BDAG, 594, 2; Mark 15:7; John 18:40), which would have been considered high treason. However, it is clear from evidence cited by Hengel (Martin Hengel, John Bowden (translator), Crucifixion in the Ancient World and the Folly of the Message of the Cross (Fortress Press, 1977) pp. 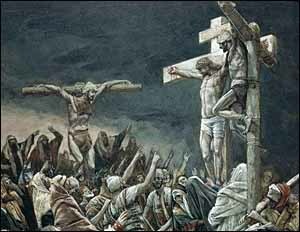 47-50) that robbers were indeed crucified by the Romans. "Robber" accords better with kakourgos than "insurrectionist." 7. Blasphēmeō, BDAG 178, 1bε. 8. Matthew 27:35b; Mark 15:24b; Luke 23:34b; John 19:23-24. 9. Or is no longer mocking, after realizing the irony of the situation and who Jesus was (Matthew 27:44; Mark 15:32). 10. Blasphēmeō, BDAG 178, 1bβ. 11. See also Matthew 28:19; Acts 2:38. 12. 1 Peter 3:21 is not arguing that baptism saves a person devoid of faith, but that the baptism itself is an "appeal of a good conscience toward God" or "the pledge of a good conscience toward God," depending upon how you interpret the Greek word eperotema. 13. Paradeisos, BDAG 761. Marshall, Luke, p. 872-873. Joachim Jeremias, "paradeisos," TDNT 5:765-773. 14. Luke 8:52; John 11:11; Acts 7:60; 1 Corinthians 15:18, 20, 51; 1 Thessalonians 4:14-15; 5:10; etc. 15. Luke 12:28; Matthew 8:26; 14:31; 16:8; 17:20.